Two lucky students at The Sixth Form College, Solihull got their hands on some great new electronic devices thanks to the College’s IT partners Lend Lease. 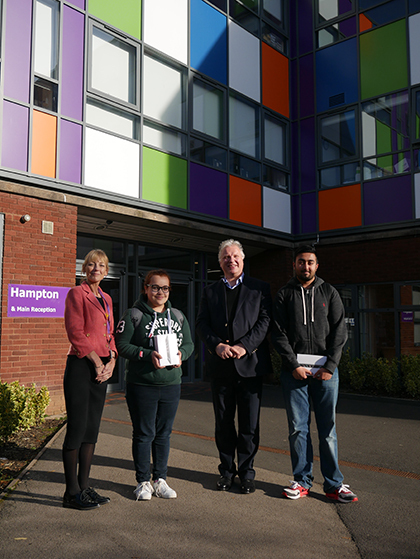 Amelia Lewis and Mohammed Adam won the Golden Ticket prize draw from last summer’s Welcome to College Day, when they attended the taster day ahead of joining the College in September. Their prizes were an iPad each, donated by Lend Lease. Amelia and Mohammed received their prizes from Vice Principal Martin Sullivan and Assistant Principal Margaret Harrison this week and they were very pleased with their new iPads. Massive thanks go to Lend Lease for their generosity. Find out more about Welcome to College Day to see what students do when they attend these taster sessions before starting at the College. We’ll be doing it all again in the summer, ahead of enrolment for those students starting in September 2017.